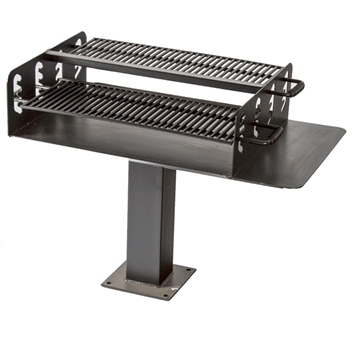 Triple Bay Park Grill, 7 Gauge Steel, Surface or In-Ground Mount, 290 Lbs. Picnic Furniture supplies commercial charcoal wood park grills perfect for BBQs at parks, campgrounds, schools, sporting arenas, and many other outdoor venues. 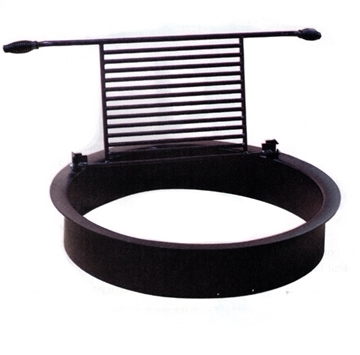 Our heavy duty grills are designed to burn wood or charcoal efficiently while withstanding long exposure to weather. 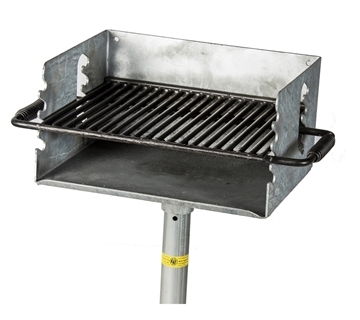 We offer many different sizes of grills to better fit the occasion such as single pedestal grills designed for smaller BBQs and pavilion group grills crafted for larger crowds. Picnic Furniture provides park grill accessories such as fire rings, fire pits, utility shelves, covers, as well as coal and ash receptacles.